The "National Anthem of Honduras" (Spanish: Himno Nacional de Honduras) was adopted under presidential decree 42 in 1915. The lyrics were written by Augusto Constantino Coello and the music composed by Carlos Hartling. In its entirety, the anthem is a brief chronology of Honduran history. The anthem consists of the chorus and seven solos. For official acts, only the chorus and the seventh are sung. 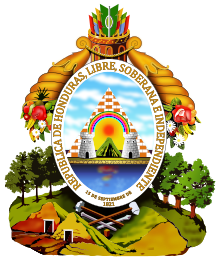 The chorus, which is sung before and after the seventh solo, is a description of Honduras' chief national symbols, the flag and the coat of arms. The eighth verse, is a patriotic call to duty to Hondurans to defend the flag and the nation. By the time Hondurans complete their sixth year of elementary education, they will have memorized and been taught the meaning of all eight stanzas. Unofficially, the anthem is sometimes called "Tu bandera es un lampo de cielo" (Spanish for "Your flag is a splendor of sky") which is also the first line of the chorus. For Graduations in middle school, High school, University, or another type of graduation, an exam will be done based on a questionnaire of the National Anthem. Hay un astro, hay un astro de nítida luz.